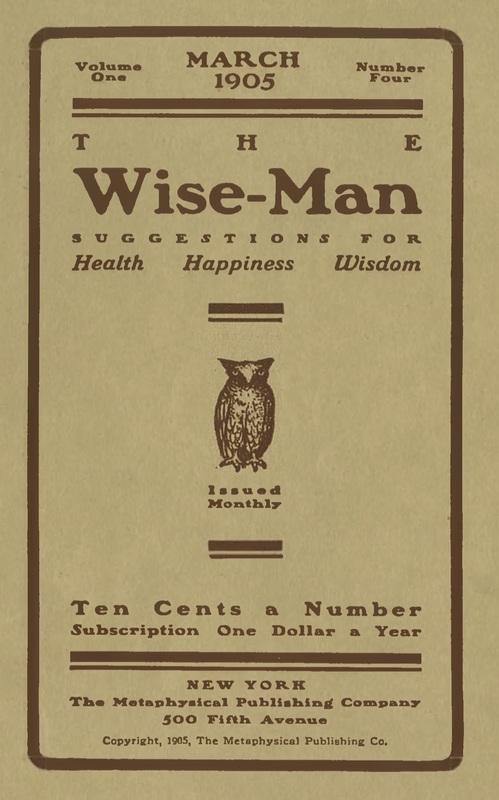 Suggestions for Health, Happiness, Wisdom / A Periodical of Occult Science and Wisdom as Applied in Everyday Life /A Monthly Periodical of Occult Science and Wisdom Simplified and Applied to Every-Day Life / Studying the Mind, Soul and Spirit through the Occult, Philosophic, Metaphysical and the Real in Life and in Being. Corporate author: Issued by the American School of Metaphysics1/1, Nov. 1903-1913(?) $1.00 a year, 32 pp. The journal always listed itself as a monthly, but the numbering of issues (1/2 is January 1904, and 1/3, is January 1905) indicates a hiatus in publication. The journal was published by The Metaphysical Magazine and advertised as "pocket size"--which seems to have been its real excuse for existence. In 1906 it was combined with its parent, but apparently only temporarily, because it appeared thereafter as a separate journal again and was still being advertised in Man--a variant name for The Metaphysical Magazine--in 1913. The issue for March 1905 has a long, sentimental article, "Is Man Alone Immortal?," by R.S. Clymer on the immortality of dogs. Whipple (1848-1916) edited the Metaphysical Magazine and wrote widely on Metaphysical Healing--including Absent Treatment in Metaphysical Healing (New York, 1891), etc.--but always in a dry and intellectual way that contrasts sharply with this journal's more popular and less restrained competitors. See the note under The Metaphysical Magazine. INTLA; LOC; NYPL; Amherst College; University of North Carolina, Chapel Hill; Skidmore Library, Lily Dale.